“Young and the Restless” (YR) spoilers for the week of Monday, March 25, 2019, through Friday, March 29, 2019 tease that “A can’t miss week with a massive twist.” We have a very exciting week heading our way and you will not want to miss a moment of the action! 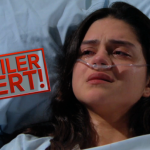 In the newest CBS “The Young and the Restless” promo video we see Arturo Rosales (Jason Canela) telling Mia Rosales (Noemi Gonzalez) that he is not going to let her blackmail him and that he will tell Abby Newman (Melissa Ordway) the truth about them before he will let her. Mia will tell Arturo that he will have to deal with the consequences then. Arturo will end up confessing to Abby and telling her the truth about him and Mia. Abby will be very furious and take matters into her own hands. Do you Y&R fans think that it is over for good between Abby and Arturo? Do you think Abby will ever forgive him? Meanwhile, J.T. Hellstrom (Thad Luckinbill) and the three ladies, Nikki Newman (Melody Thomas Scott), Victoria Newman (Amelia Heinle), and Sharon McAvoy (Sharon Case) will all be unconscious at the cabin but will Nick Newman (Joshua Morrow) and Victor Newman (Eric Braeden) will save the day. They will arrive to find everyone passed out and will drag them all outside, including J.T. Once all the ladies are okay Christine Williams (Lauralee Bell) will make sure they are put back behind bars. As for J.T., he will be taken to the hospital where he will get some news that we never seen coming. Victoria’s hell is still far from over. Are you Y&R fans liking this storyline or are you ready for it to be over? Other “Young & Restless” spoilers suggest that Kyle Abbott (Michael Mealor) confesses the truth to Lola Rosales (Sasha Calle). Paul Williams (Doug Davidson) takes control. Sharon McAvoy will stand by Rey Rosales (Jordi Vilasuso). Devon Hamilton (Bryton James) will extend an olive branch. Cane Ashby (Daniel Goddard) will get a reality check. Ashely Abbott (Eileen Davidson) will shock the Abbotts. As you can see we have a very eventful week coming up, so make sure to stay tuned to CBS “The Young and the Restless” to see how this all unfolds. Don’t forget to check often with Soap Opera Spy for all your latest spoilers, news, updates, and much more.